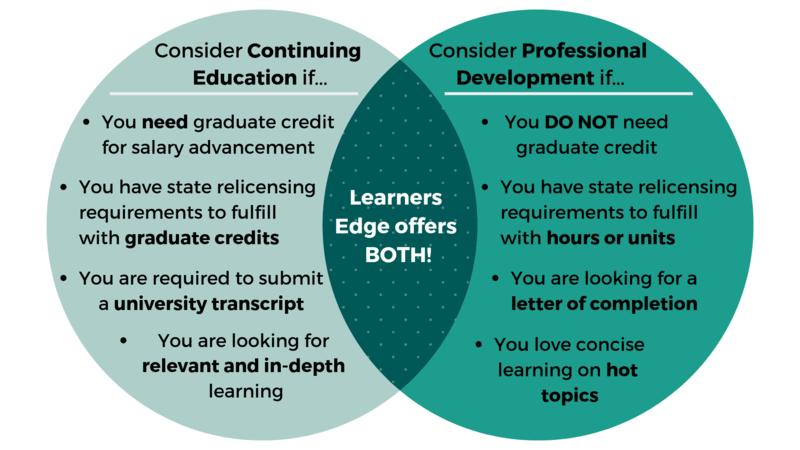 Below is a summary of how Learners Edge may help your continuing education and Alabama teacher relicensing needs. This summary should in no way release individuals from their responsibility of ensuring that the course they take meets their professional needs. We hope it provides assistance in understanding how Learners Edge might help you in the accumulation of clock hours or graduate credit for salary advancement and the Alabama teaching relicensure process. See the Alabama State Department of Education website for complete AL teacher relicensure information. 3 full years of full-time professional educational work experience and 50 clock hours of allowable professional development. 3 full years of full-time professional educational work experience and 3 semester hours of allowable credit. 3 semester hours of allowable credit and 50 clock hours of allowable professional development. 6 semester hours of allowable credit. Allowable credit earned and applied for renewal must be completed at a regionally accredited senior institution. Note: For options 2.a. or 2.b., if credit is earned at a non-Alabama regionally accredited senior institution, Supplement RCR must be submitted to verify that the coursework is part of a state-approved P-12 educator preparation program. Supplement RCR may be found at www.alsde.edu/EdCert (click Certificate Renewal / Professional Educator).